Ohio State University Extension's Family and Consumer Sciences (FCS) serves thousands of people throughout Ohio every year. Our team of FCS professionals delivers the highest quality, research-based educational programs focused on building Healthy People, Healthy Finances and Healthy Relationships. We help people keep healthy through good nutrition and food safety, use their money wisely, and balance the demands of life and work. Explore highlights of Family and Consumer Science programs with our convenient Digital Folder. 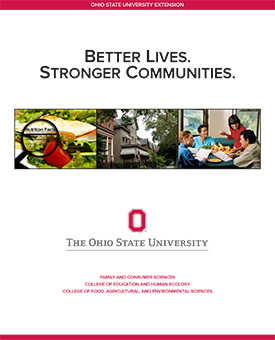 OSU Extension FCS aspires to be the recognized leader in the state for enhancing the quality of life for individuals, families, and communities through research, education, and outreach. We value diversity and strive to build on the assets of the individuals, families, and communities we serve. OSU Extension FCS is Empowerment Through Education.